Wow, what a great UPS weekl!!! Just delivered are new products from October Afternoon, Die Cuts with a View (cutest school paper ever), really cute baby through toddler lines from Sandylion. How about making a card using these fabulous stamps? 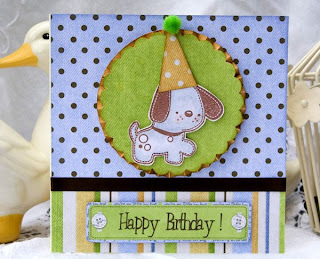 There are more new papers and embellishments from Kelly Panacci, and last but certainly not least Maya Road! While you are here be sure to check out the newest lines from, My Little Shoebox, beautiful papers and embellishments that would be wonderful to use with all those great pictures you are sure to have taken over the summer! To kick off the fall season, which is just around the corner K & Company has done it again, with their awesome Halloween Whimsy. This spooky line not only has paper and embellishments, but cute decorations that are a snap to put together! As always, priority shipping within the US is only 4.95.